Video Game Distributor 2 years behind in deduction processing, caught up in weeks! Apparel Distributor saves 400+ manpower hours quarterly with deduction automation! Both distributors now painlessly managing deductions and processing up to 1,500 claims a month! 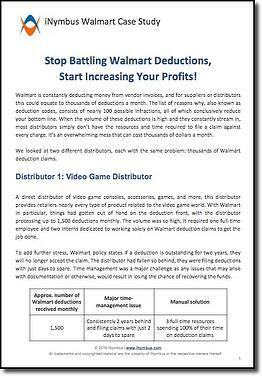 Enter your information to receive our iNymbus Walmart Deduction Case Study.